The idea is really simple. After a quick meeting we take our lunch, paper and pen and go for a walk. In small groups we will explore poetic ways to capture TU life. After a couple of small, fun and provocative assignments, we will head back and behold our ‘output’. This is the second Poetry Clinic in a series. We’ll end with a quick thought on the future. Will this Poetry Clinic be the beginning of something bigger? Should we make poetry more visible on campus? What’s next? Being an academic at a university of technology can be a bit restrictive in terms of how you can express yourself. Why not try something different? For several years now, professor Bauke Steenhuisen of the TPM faculty has been showing how versifying (=making poetry out of) research summaries, theses, or reports makes them more interesting, tantalizing, and perhaps even accessible for a broader public. 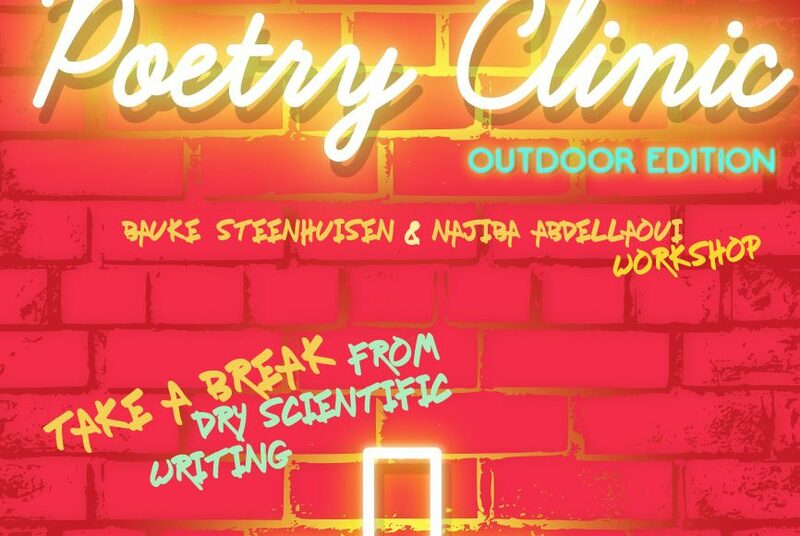 During this Poetry Clinic with Bauke and award-winning slam poet Najiba Abdellaoui, you will receive tips and support on how to take the densest, driest of prose and transform it into poetry. Try a haiku, or free verse, sonnets, limericks, and more. There will be a selection of published thesis summaries for you to experiment on. Or if you prefer, versify your own work! Free lunch provided! Let us know if you are a vegan or vegetarian or have other dietary concerns. This low key workshop will last from approximately 12:40 till 2:00pm, but if you need to leave earlier that’s not a problem. Bauke Steenhuisen is an assistant professor at TPM. Najiba Abdellaoui is an award-winning performance poet, author, and Communications professional who also teaches Spoken Word and Personal Storytelling in Rotterdam.